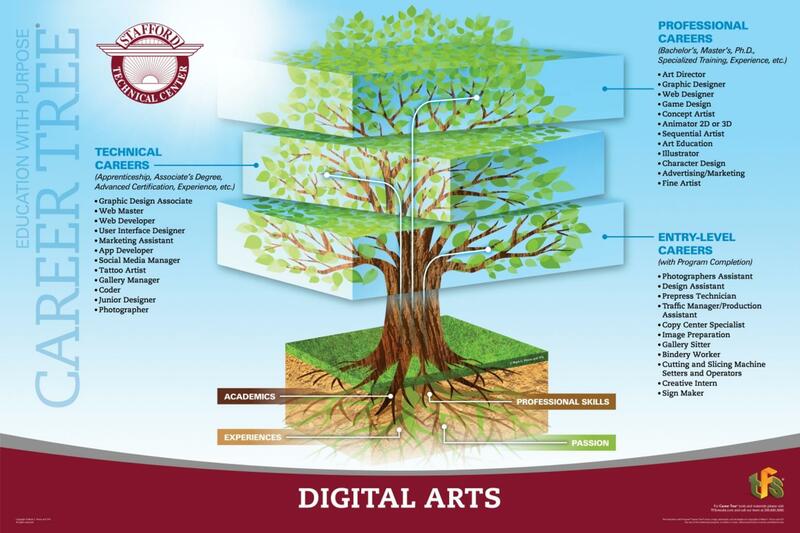 The Digital Arts program is the place for you if you are a visual and creative hands-on person interested in a career in the arts. Students explore communication and visual language through hands-on project-based activities. Personal vision and individual artistic aesthetic are nurtured and encouraged, fostering student investment in project-based learning. This is a college-bound Program. Students develop a portfolio of work for the college application process. Curriculum and specific lessons are based on introductory college curriculum. work with clients creating media which best promotes their products and gain real-life experience while building a strong college portfolio. Learn to use technology as a vehicle for personal imagination and vision. The class often functions as an advertising agency/production house. Working with Stafford as a client, students create design and marketing strategies that appeal to their clients. Karen Kysar came to Stafford Technical Center in 1998. She taught Video Multi Media from 1998-2001. 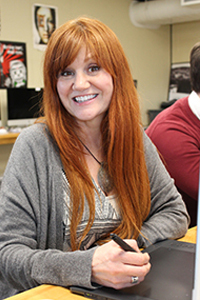 In 2002 she created the concept and curriculum for a Digital Arts program which opened in the fall of 2002. Karen received a Bachelors of Fine Arts from the Minneapolis College of Art and Design. She has taught for Castleton State College and CCV. She worked as an Artist in Residence in Minnesota from 1990 to 1998 working extensively with learners with disabilities and at risk communities. Karen is very passionate about teaching and technology. She believes in exploring technology as a vehicle for personal vision and imagination as well as a form of communication. What I got from STC was a great foundation. I already knew so much before I ever set foot at university and because of that when so many of my friends and classmates were struggling under deadlines I was relaxed and in control. I knew what I needed to do and how to do it. After graduating high school, I went to London to study design at the University of The Arts, London where I received a BA(Hons) in Digital Media. Up to twelve college credits are available through Community College of Vermont, fifteen credits through Lyndon State College, and three credits through Castleton University. *Average Salaries taken from the United States Department of Labor (dol.gov), Payscale (payscale.com), and Sokanu (sokanu.com). Essay Requirement for Digital Arts: Please address the following in a 1-2 page essay: Why do you want to enroll in the Digital Arts program at Stafford Technical Center? What are your career goals? Please describe any artistic and/or computer experience that you have (i.e. classes, extra curricular activities, hobbies, or influences). Portfolios or examples of work are highly recommended. This could be a photocopy of a drawing or and address to a web page that you created. 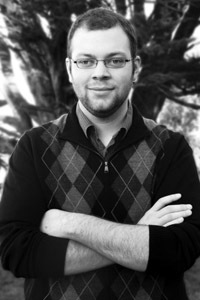 The instructor recommends that students write the essay after their visit to the program.